Looking at Table Mountain from the Cape Town Waterfront, the mountain presents an eye line about 1000 meters above sea level. Behind the mountain's top, towards the south, is a lower plateau at about 800 meters above sea level. In this area five dams have been built more than a century ago. It may come as a surprise to learn that a small 0-4-0T industrial locomotive was used to help build some of these dams. 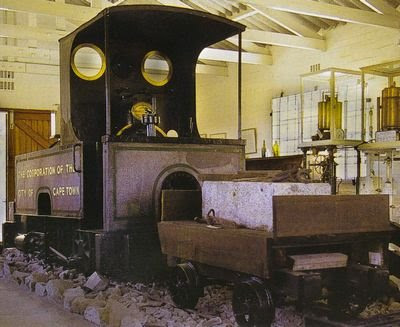 The little locomotive is still on the mountain and is the main exhibit inside the Waterworks Museum near the wall of the Hely-Hutchinson reservoir. The locomotive, works no 826, was built by Andrew Barclay, Sons & Co Ltd, Caledonia Works, Kilmarnock, Scotland, and was dispatched from the workshop on 7 October 1898. The buyer was Davis & Soper of London, presumably an agent for "The Corporation of the City of Cape Town" (municipality) which was building the dams on Table Mountain. As a special type of industrial locomotive, no 826 is an example of a light contractors steam engine well suited to the task. Its main task was to transport barrels of cement and equipment from the terminal of the cableway to the reservoir site works, plus the distribution of cut dressed stone blocks along the working site of the dam wall. This is a 0-4-0T type with the 4 wheels of course coupled. The gauge is 2ft 6inch. It has 5" diameter cylinders (with 10" stroke) on the outside of the frame . It had no steam brakes - the hand operated mechanical brake can be seen in the cab. Boiler pressure at 85% of maximum was rated at 120psi - the last boiler test was done on 30 September 1898 at the builder's works in Scotland. Its tractive effort would have been 1275 lbs. The location of the Waterworks Museum is about 800 meters above sea level, and can only be reached on foot. The easiest route, starting at about 200 meters above sea level, is to walk for about 2 hours up the water works access road starting from Constantia Nek. 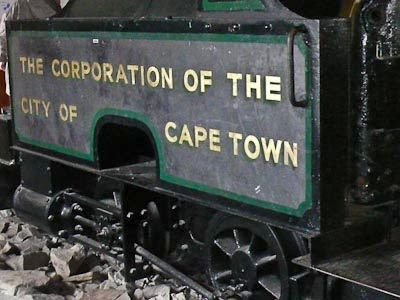 After arriving from England by sea, the locomotive was dismantled in the Cape Town harbour. 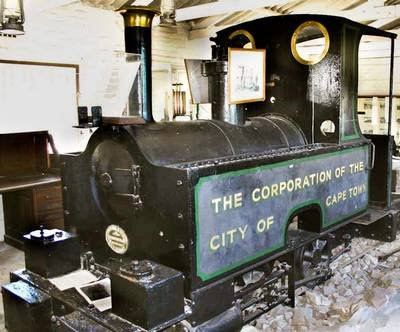 The parts were then transported by wagons from the docks to the cableway base station in Camps Bay. The items were then taken up to the dam construction area via the Kasteelspoort Ravine. Lighter parts could be taken up via the cable system. 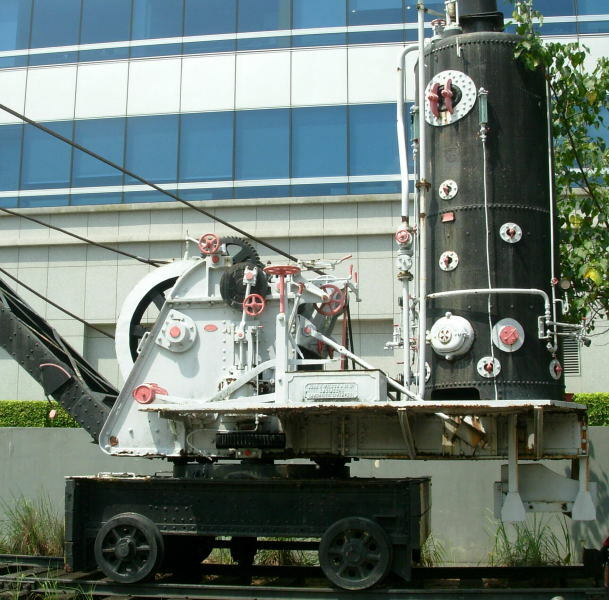 The boiler, due to its weight and size could not be taken up by this means. It was put on a wooden sledge, and with the use of a block and tackle, was winched up the gorge. This latter operation took two weeks. The locomotive was reassembled at the work site. After tested, the locomotive started its job of pulling a train of 4-wheeler trucks. 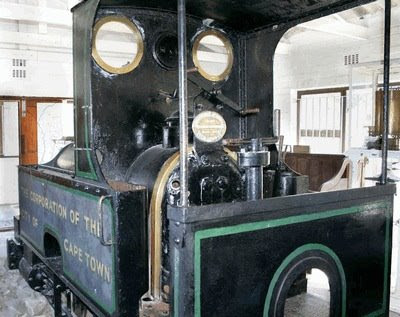 The locomotive was used to haul goods from the Kasteelspoort top cable station to the construction site. 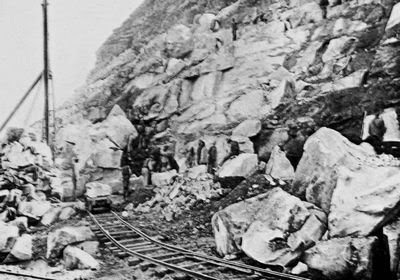 The sandstone for the dams was quarried from the Buttress of the mountain above Camps Bay and the railway ran for about a mile-and-a-half (2.6km), serving stone dumps and a block making depot. The dressed sandstone blocks were then again moved to the works on the dam itself. 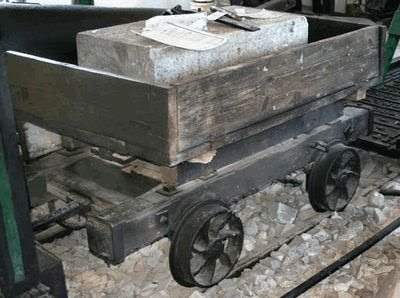 The museum exhibits the loco with this payload in tow. Archives photo of the loco: This picture shows the locomotive works No. 826 after completion by its builders at Barclay and Sons' Caledonia Works, Kilmarnock, Scotland. Standing next to the locomotive is the works foreman Mr. R. Duncan. 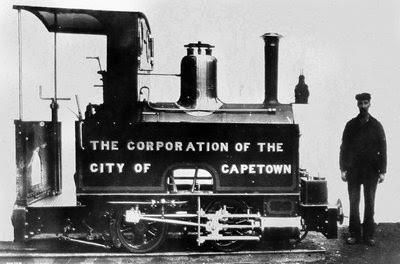 The locomotive left the works for Cape Town on 7 October 1898. Archives photo of the loco in operation. 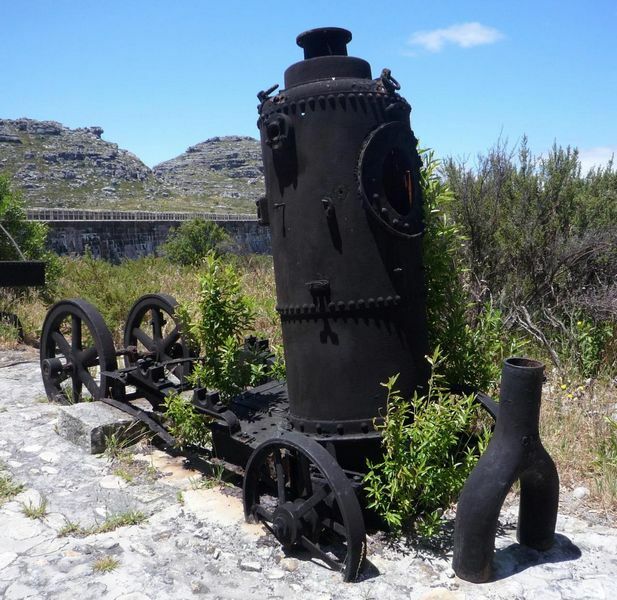 The locomotive used a coal fire - the coal for this came all the way from Wales, and also had to be brought up the Kasteelspoort Cable system. 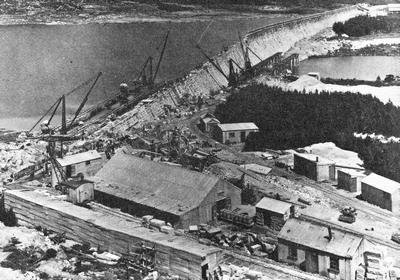 This Archives photo shows the Hely-Hutchinson dam under construction. Of note is the 4 lines of railway track visible. Possibly it is the outline of the loco just visible at the right-most corner of the large building (block making depot). A rail wagon in front of the depot possibly is loaded with dressed blocks. At the left-most corner of the large building a steam crane is visible on one of the rail tracks. In the photo above a small sandstone building stands in front of the block making depot - it survives to this day and appears in the photo below in front of the Waterworks Museum. The locomotive has been kept in a shed in the Ranger‘s storage area ever since its use on the reservoirs. The museum was founded in 1972 by Terence Timoney, a retired waterworks engineer. 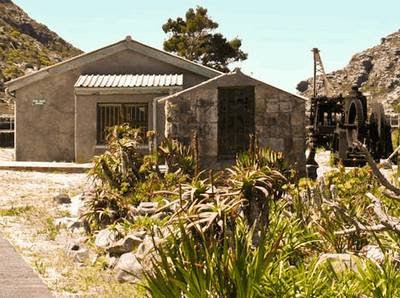 The museum houses a display of memorabilia from the construction of the dams on Table Mountain. 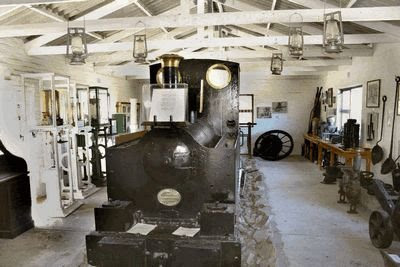 It has an interesting display of original equipment, hand tools, instruments and photographs and includes the original well-preserved steam locomotive used to haul equipment from the old cable way at Kasteelspoort. Since the death of the museum’s dedicated founder, Terence Timoney, the Waterworks Department has taken over his voluntary work of manning it. The museum is open seven days a week during summer and on weekends only during the winter months (May to October). Closed any time during bad weather. For access during winter weekdays, phone the manager on duty at Newlands Reservoir. Outside the museum stands a relic of the steam crane used on the construction site. The steam cylinder and driving mechanism is visible on the left side. Following in pictures below is the boiler that came off the crane. Also refer to the archives photo above of the dam building site. 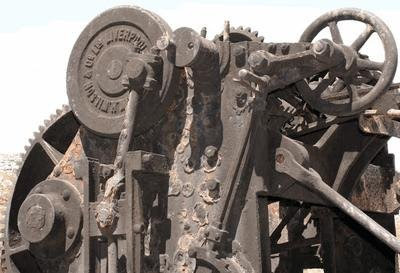 Detail of driving mechanism on the steam crane. The crane was made by John H Wilson Co Ltd of Liverpool. John H. Wilson and Company was of Birkenhead and Sandhills, Liverpool. This 2009 photo by Danie van der Merwe (as posted on flickr) shows the steam boiler of the Wilson crane grouped with a number of unrelated loose items. 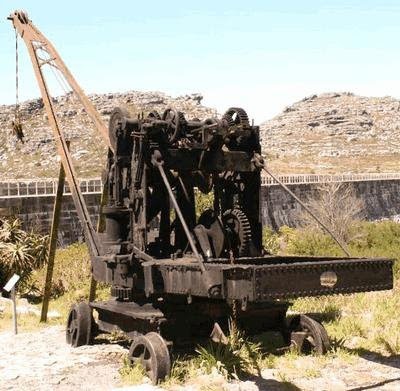 The photo above gives a general impression of what the Table Mountain Wilson crane would have looked like originally. 2nd Feb 2007 photo - Photographer unknown: This is a steam crane made in 1879 by John H Wilson of Liverpool. It still worked until the early 1980's. The crane was made for use at Albert Dock, Tanjong Pagar Dock Company, Singapore. Now preserved on public display near ferry terminal ('Harbour Front'). This crane has many similarities with the one found on Table Mountain. Also check out Danie van der Merwe's 2009 "Hike up Skeleton Gorge to old cableway site on Table Mountain" here on flickr. IMPORTANT NOTE: None of the images used in this article is my own work, and are reduced versions of larger images available elsewhere on the web. My thanks and credits to the rightful owners of all these images. Thomas Stewart, a Scottish Civil Engineer, came to the Cape in 1882 at the age of 25. He had been recruited as assistant to the Hydraulic Engineer of the Cape Colony, Mr John Gamble. Thomas carried out many functions satisfactorily. Having successfully built a reservoir near Constantia Nek, he felt it was time to invite further commissions and in 1892 he set up on his own in St Georges Chambers, Cape Town as a consulting engineer. Almost immediately he was commissioned to design and arrange for the building of the Woodhead Reservoir on the top of Table Mountain. The logistics of construction on a mountain top were a challenge in themselves. 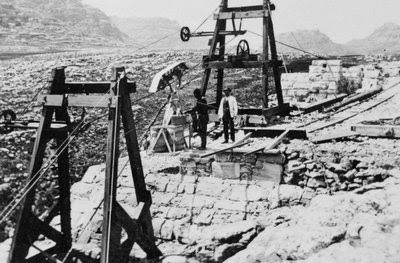 He commissioned a cableway up Kasteels Poort from Victoria Road, Camps Bay, to transport men, materials - including heavy casks of cement imported from Scotland - to the summit, which were then pulled by mule power along rail tracks to the dam site. Stewart and his workforce lived on the mountain for three years. He then gathered the survivors of his previous work force and began work on the Hely-Hutchinson Reservoir, as the new dam was to be called. 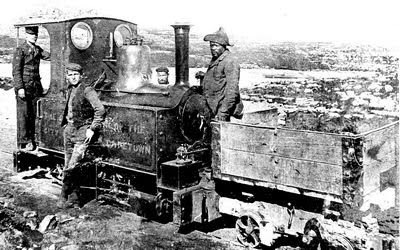 To improve logistics a small locomotive was imported from Kilmarnock, knocked down, hauled up the cableway and reassembled at the top, where it replaced the mule train. It has remained there to this day, and is now housed in the small waterworks museum at the dam.